The Institute of Plastics Processing (IKV) in Industry and the Skilled Crafts at RWTH Aachen University invites to the symposium on reactive pultrusion on 9 October 2018 to Aachen, Germany, where specialists from industry and research will present and discuss the latest developments. Dr. Hubert Ehbing from Covestro Germany will be the chairman of the symposium. 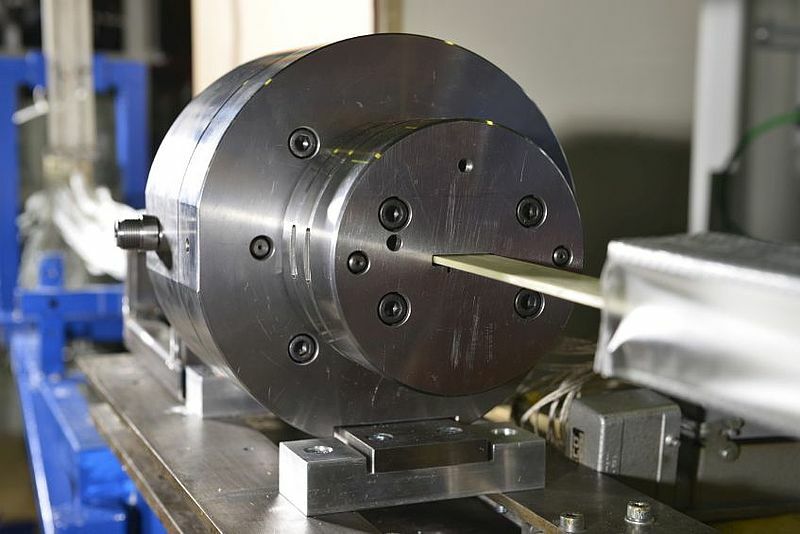 As a continuous process, the pultrusion offers great potential for a cost-efficient production of highly loadable profiles made of continuous fibre reinforced plastics. For a large-scale production, highly reactive resin materials are increasingly focused in current developments, e.g. polyurethanes, epoxy resins or insitu polymerising thermoplastics. Due to the low viscosity of the basic material, they offer excellent impregnation properties. Thus, high performance profiles with high fibre volume contents and excellent mechanical properties can be realised. At the same time, the profile production can be realised very cost-efficient at high production speed due to the high reactivity of the material systems. However, the use of highly reactive systems results in new challenges for reactive pultrusion such as a process-oriented design and construction of the injection box instead of a conventional impregnation bath and necessary modifications of the die technology. Furthermore, the importance of a precise process management, process control and quality assurance increases in order to guarantee a robust and cost-efficient production. Against this background, various applications and potentials for the pultrusion with reactive materials in high volumes will be demonstrated and discussed during this symposium. Researchers, material suppliers, processors and customers have the opportunity to inform themselves about new material developments, suitable machine equipment and die technologies as well as current research activities and discuss the presented solutions with technical experts. The Speakers will come from Arkema Innovative Chemistry, BASF Polyurethanes, Carbon Truck & Trailer, Covestro, KraussMaffei Technologies, and Thomas Technik + Innovation. Subjects from research will be contributed by the University of Twente, Enschede, the Netherlands, and from IKV. The symposium on Reactive Pultrusion addresses engineers and technical managers in the areas of development, production and sales of innovative reactive resin systems, process development and production planning as well as processing equipment for series production of lightweight profiles and the associated quality assurance. Further information on the event is availabe here: IKV-events.